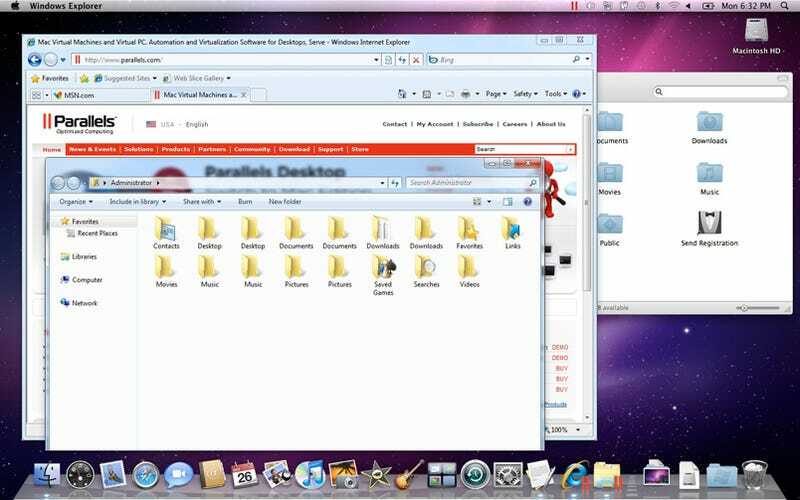 It's a virtual war: VMWare Fusion 3 for Snow Kitty and Win7 popped out last week, and now here's Parallels 5. It's also fully 64-bit, with Windows apps that behave like native ones, including full multitouch gestures, and more zoomzoom. Like Fusion, Parallels supports OpenGL 2.1 and DirectX 9 Shader Model 3.0 for the full Aero 3D interface and 7x better graphics performance than before. It also has a migration tool to move a PC's info to your virtual machine. Overall performance-wise, it's three times faster than before, supports 8 virtual CPUs and automatically pauses the virtual machine whenever no Windows apps are running. Update: The Parallels guys point out that Fusion supports OpenGL 2.1 just in XP, but only 1.4 in Vista and Windows 7, while Parallels supports 2.1 in every version, which they say means games will run better in Parallels. We'll definitely be checking that out.